Kidnapping is an ever present threat in some parts of Latin America. 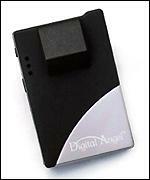 But digital tracking technology may now be able to help potential victims. What's involved is a surgically implanted identification chip that can establish precisely who you are, and a wearable device about the size of a cassette tape. The technology uses the US Global Positioning System (GPS) to track where you are. If you are abducted, these gadgets will help you be found and rescued. Or so Applied Digital Solutions, the company marketing these products, hopes. In partnership with risk management firms in three undisclosed Latin American countries, the company aims to offer that extra bit of personal security to business executives and others potential abduction and ransom targets. This presumes the kidnappers do not discover and remove the GPS device in the first place. This kind of tracking technology was developed with other purposes in mind such as keeping track of criminals on parole. It was also used by the caring professions to keep an eye on patients who may have a tendency to wander. And implanted identity tags have been inserted into pets for years. But where people are concerned, there are medical and ethical concerns. The new security proposal may seem a bit heavy-handed. But it is being considered because kidnapping is a growing problem in Latin America, specifically in Brazil where some high-profile cases have occurred and in Colombia, where more than 3,000 people are snatched annually, according to the US State department.